Workshops, culinary activities, crafts, outdoor games, sensory bins, and role play ideas to ease into fall. 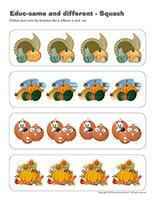 Word flashcards, a picture game, activity sheets, coloring pages, daycare decorations. 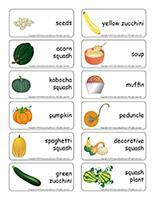 (Open thematic poster-Squash) Print, laminate, and decorate the walls of your daycare with all kinds of posters. 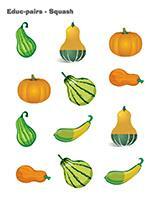 (Open educa-decorate-Squash) Print, laminate, and cut out the various items. Use them to decorate your daycare and set the mood for the theme. (Open garland-Squash) Print the illustrations. Let children decorate them. 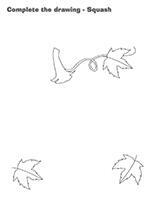 Cut them out and hang them within your daycare or near your daycare entrance to create a garland. Transform your daycare to represent harvest time. Draw trees and fields on cut brown paper bags. Encourage children to cut pictures of fruits and vegetables that are harvested (apples, potatoes, tomatoes, corn, strawberries, raspberries, blueberries, etc.) out of grocery store flyers and stick them here and there. Deposit fruit and vegetable baskets on a table or counter. (Open Poni discovers and presents-Squash) Print and laminate the cards. Cut them out and use a Poni puppet or another puppet children are familiar with to present the different types of squash (and their cousins) to your group. Dress up like a farmer and fill a basket with a variety of vegetables, including different types of squash. With your group, name each one along with its characteristics. Ask children if they have visited an apple orchard, a pumpkin patch, etc. Do they have a garden in their backyard? Have they ever been to a farm? 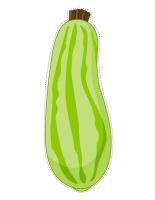 (Open picture game-Squash) Use the pictures to decorate your daycare or to spark a conversation with your group. Print, laminate, and store the pictures in a Ziploc bag or in your thematic bin. 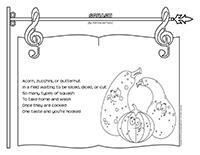 (Open activity sheets-Squash) Print and follow instructions. 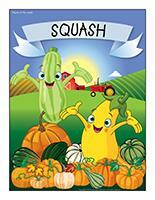 (Open writing activities-S like squash) Print for each child or laminate for use with a dry-erase marker. (Open stationery-Squash) Print. Use the stationery to communicate with parents, in your writing corner, or to identify your thematic bins. Use LEGO or wooden blocks to build a barn, silos, etc. A variety of cut fruits and vegetables that can be used as stamps. Ideally, use food items that are "past their prime" to avoid wasting them. Glue different types of seeds on construction paper (wheat, corn, barley, etc.). Make maracas out of recycled containers filled with seeds. Use empty milk cartons to make vases for flowers children pick in your yard or during walks in your neighbourhood. Make prints and paint using corn cobs. Pumpkin shapes that can be filled with crumpled pieces of tissue paper. Empty toilet paper rolls, construction paper, and paint to make miniature apple trees. Use tree branches and leaves as paintbrushes. Fruit, vegetable, harvest time, and farmers' market coloring pages. Stencils of different types of fruits and vegetables that are harvested. At the market: fruits, vegetables, flowers, baskets, reusable bags, a scale, a cash register, pretend money, etc. At the apple orchard: A cardboard tree on a wall or a branch in a bucket to represent an apple tree, colourful apples, pie plates, apple juice containers, pictures of different types of apples, etc. I am gardening: gardening accessories and tools, gloves, flower pots, pictures of different types of flowers, fruits and vegetables, hats, etc. Memory game involving vegetable, fruit, or flower illustrations. Sorting game: fruits and vegetables. A container filled with a variety of dried beans that can be sorted by color. 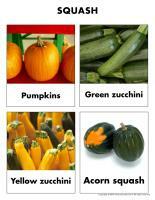 Different types of squash that can be manipulated and observed. Miniature squash are very resistant and can be kept for long periods of time. 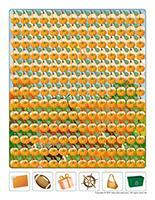 Association game with pictures of different types of fruit and pictures of the corresponding fruit trees. Books, books, and more books related to the theme. A scarecrow will make the perfect companion for your little readers. Set it in your reading corner for the duration of the theme. Replace the ball required for various games with an apple, a carrot, or a miniature squash. Squash treasure hunt in which children must search for miniature squash in the yard. Fill a container with dried corn cobs. Fill a container with popcorn. Fill a container with all kinds of seeds and containers that can be used for filling and emptying. A container filled with dirt and live worms. A container filled with pine needles and pinecones. Use seasonal fruit to make a salad and serve it at snack time or for dessert. Association game with seeds and pictures of the vegetables they will become. Different types of vegetables and squash that can be observed with a magnifying glass. Use a juice press to make juice out of different types of vegetables. Visit your local grocery store and search for squash. What happens when we leave sliced apples out to dry? (Open game-This is my spot-Squash) Print two copies of each illustration. Use adhesive paper to stick one copy of each illustration on the table. Place the second copy in a bag. Children take turns picking an illustration to determine where they must sit at the table. You may also use the illustrations to determine children's naptime spots or their place in the task train. 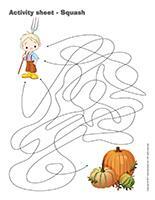 (Open my squash path) Print, laminate, and secure the illustrations on the floor of your daycare to create a path leading to the areas frequently visited by children throughout the day. The path can lead to the bathroom, the cloakroom, etc. If you prefer, use the illustrations to delimit various areas. Empty a few small decorative squash and insert a tea light candle in each one. Use them for a candlelit lunch. Paint decorative squash using different colors (a different color for each child). Paint a circle of each color and set one circle in front of each spot at the table. Have each child pick a squash. Invite them to deposit their squash on the circle of the corresponding color and sit down at their spot. 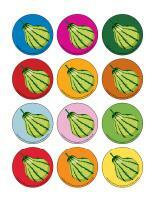 (Open educa-decorate-Squash) Print and laminate the items you wish to use. Make a hole at the top of each illustration and hang them from a hanger using fishing wire. Cut the top off a squash and let little ones manipulate its insides. They will make interesting discoveries. Purchase several types of decorative squash. They are very resistant and therefore ideal for being manipulated by little hands. Encourage children to roll them around and weigh them. Fill large containers with dirt. Let children use their hands to mix the contents of the bin. Provide small shovels and a variety of plastic containers they can use to play in the dirt. Purchase one or two pumpkins. Invite children to take turns carrying the pumpkins from a starting point to a finish line. This non-competitive activity will help children realize just how heavy pumpkins really are. Variation: Purchase very round pumpkins and have children roll them around. Fill a large container with dirt and add a few different types of decorative squash. Children take turns digging for squash for 30 seconds. Who will find the most? Variation: If you do not wish to use dirt, you can do the same activity using hay or rice. (Open models-Squash) Print and laminate two copies of each model. Hide one copy of each in your yard. Children must search for the squash illustrations and associate them to the identical illustration displayed on a wall or on a table. Variation: You may also choose to hide several miniature squash in your yard. Encourage each child to find one squash. Later, children can paint and decorate their squash with different arts & crafts materials. Have children complete a small course with a partner. The child who is the wagon must walk on his/her hands while his/her partner holds his feet. Select one child to be the scarecrow. The other children are birds. The scarecrow must touch the birds so they don't eat the seeds that are planted in the garden. Each time the scarecrow touches another child, this child also becomes a scarecrow. The game continues until all children are scarecrows. Use rope to tie a cardboard box behind each bike you have on hand to represent tractors. Deposit balls throughout your yard. They are pretend squash that must be harvested. Encourage children to ride the bikes around the yard to collect the squash. Draw lines in the sand in your sandbox to represent rows in a field. Encourage children to hop over the rows. Variation: You can also use chalk to draw rows on asphalt or even simply arrange jumping ropes on the ground if your sandbox isn't big enough. For this activity, your sandbox becomes a garden. Hide plastic fruits and vegetables in the sand and invite children to dig them out. Sit in a circle. Play fast-paced music. Children pass a small decorative squash around the circle. When the music stops, the child holding the squash must answer a squash-related question. If he/she has the correct answer, he/she may remain in the circle. If he/she does not know the correct answer, he/she must sit outside of the circle and clap his/her hands to encourage the remaining players. Make maracas with your group. Use a variety of plastic containers, cylindrical containers (Pringles), or even plastic eggs. Fill them with pumpkin seeds and shake them to create interesting sounds. (Open educ-intruder-Squash) Print and laminate. Children must find the six (6) intruders. (Open educ-same and different-Squash) Print and laminate for durable, eco-friendly use. Children must circle the illustration that is different in each row. (Open hunt and seek-Harvest time) Print and laminate. Children pick a card and search for the corresponding item in the scene. 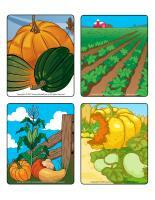 (Open puzzles-Harvest time) Print, laminate, and cut out the pieces. Encourage children to place the pieces to recreate the scenes. (Open association game-Harvest time) Print, laminate, and cut out. Have children associate each food item to the correct picture depending on if it grows in the ground, above ground, or in a tree. (Open educ-pairs-Squash) Print. Children must color identical illustrations using the same color or draw a line between them. For durable, eco-friendly use, laminate for use with a dry-erase marker. (Open educ-trace-Squash) Print for each child. Children must trace the dotted lines using a crayon of the corresponding color and then color each object using the same color. (Open educ-differences-Squash) Print and laminate for durable, eco-friendly use. Children must find the differences between the two pictures and identify them using a dry-erase marker. (Open magnifying glass game-Squash) Print and laminate the board game and the cards. Cut them out and store them in a box or bag. Children pick a card and then search for the item on the board game using a magnifying glass. When they find a match, they set the card in the corresponding square on the board game. Ask parents to help you visit a pumpkin patch with your group. Several apple orchards now grow pumpkins too. Ask parents if anyone in their family grows pumpkins or other types of squash in their garden. If they do, visit their garden if possible or ask them to provide pictures. 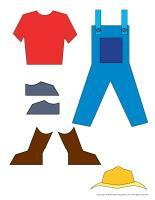 (Open dress-up dolls-The farmers' market) Print and laminate. Set the pieces on a table and let children dress the doll as they wish. Use boxes and bed sheets to build a barn. Throughout the theme, provide plastic containers, empty cardboard boxes, etc. Children will use them to add to their décor. Set several different types of squash in a corner. At first, children will simply manipulate them. Later in the week, cut them open to give them the chance to explore the insides of the squash with their hands, spoons, and magnifying glasses. Empty a pumpkin with your group. Roast the pumpkin seeds and serve them as a snack. Provide plastic flower pots. Fill them with dirt and let children plant vegetable seeds. For best results, plant green beans. Have children water the seeds daily. Leave the flower pots in direct sunlight and observe the changes with your group. Prepare squash soup with your group. Cook the onions, garlic, and squash in the butter or oil. Add a small amount of chicken broth so the mixture doesn't stick to your pot. Add the remaining chicken broth, tomato, spices, and sugar. Cook until squash is tender. Puree in a blender until soup is smooth. Add a dollop of sour cream on top prior to serving. Clean and thoroughly dry the seeds you collected when you emptied a pumpkin with your group. Spread them out on a baking sheet. Drizzle them with olive oil and sprinkle with salt. Roast them in the oven. Allow to cool before serving. Prepare muffins with your group and let each child spread orange icing on his/her muffin to represent a pumpkin. Use chocolate chips to represent eyes, a nose, and a mouth. (Open models-Squash) Print for each child. 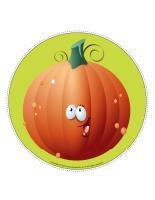 Using white glue, children must stick pumpkin seeds (or seeds from other types of squash) all over the shapes. Let dry and display on a wall. As a group, create a scarecrow you can set outside, near your daycare entrance. Fill old clothing items with scraps of newspaper. Knot the extremities. Use an old ball for your scarecrow's face. Let children get creative. Provide different types of seeds, dirt, and wood chips. Let them glue the items on a piece of construction paper. Provide several different types of seeds, bulbs, etc. Encourage children to trace them on a sheet of paper with crayons. They may also glue them on a banner and decorate the seeds with paint, glitter, etc. (Open model-Pumpkin) Print for each child. Have them tear and crumple pieces of orange tissue paper they can then use to fill their pumpkin shape. (Open pumpkin man) Print. Have children color and cut out the various parts. Use the pumpkin to represent the head and body. Use strips of orange construction paper folded accordion-style to represent arms and legs. 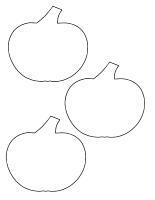 Glue a medium-sized pumpkin to one end of each strip to represent hands and feet. (Open complete the drawing-Squash) Print for each child. Have them complete the drawing as they see fit. (Open creative coloring-Squash) Print for each child. Have children complete the drawing. 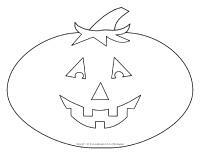 (Open coloring pages theme-Squash) Print for each child.